You tell us when you've figured out what's so intimate about letting MySpace users orchestrate, then monitor, one of the most important days of your life. The web series is casting for couples now. 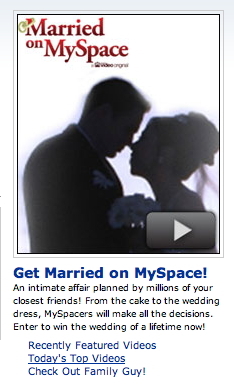 URL: www.myspace.com/marriedonmyspace, but it keeps redirecting to MySpace.com. Lucky lovebirds can expect to be exploited, pampered, dressed and coddled by the Zeitgeist across 13 episodes leading up to the big day.